Indian Home Remedies to relieve constipation, Recipes + Foods for constipation. 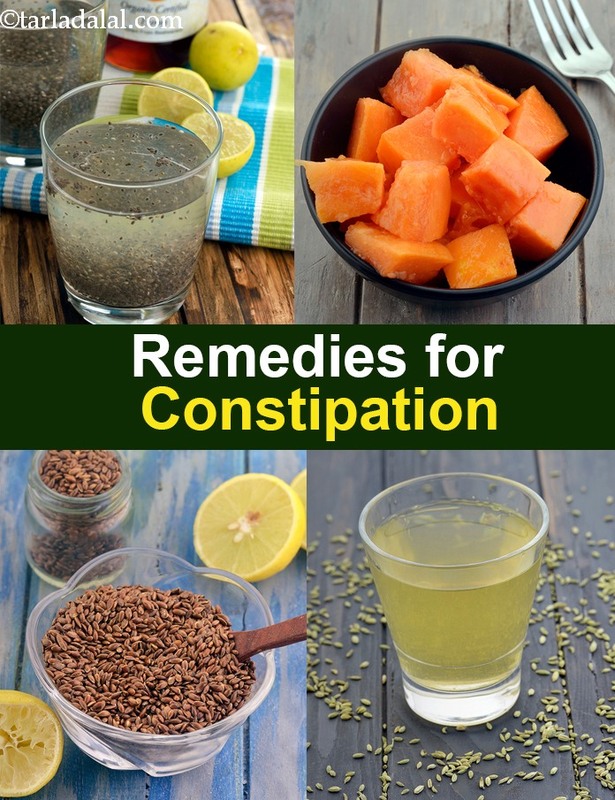 Indian Home Remedies to relieve constipation, Recipes + Foods for constipation. Constipation is a condition of the bowels in which evacuation is difficult and infrequent. Eat clean healthy food, maintain an daily exercise program and your on your way to saying goodbye to constipation. Given below are the Indian remedies for constipation or basic remedies for constipation. 1. Consume plenty of fruits and vegetables (with their skin on), whole grains such as Whole Wheat, jowar, bajra, buckwheat, ragi, oats and barley to the stools and help in bowel movements. One flavourful way of adding these fruits and veggies to our diet is Carrot Lettuce and Date Salad . Include bajra roti, jowar roti, radish nachni roti recipe , basic ragi roti recipe, and whole wheat roti with your lunch or dinner so that you get more fibre and this is far healthier than having refined flour like naan and puris. 2. Fibre rich fruits: The high fibre content in these fruits adds bulk to our diet thus regulating bowel movements and preventing constipation. Have at least 1 to 2 fibre rich fruits like orange, sweet lime, pineapple, grapes, guava etc. at bedtime to overcome constipation. You can also try the recipe of an unstrained juice like Papaya Pineapple and Banana Drink . 4. Flaxseeds are the second richest source of fibre after chia seeds. Follow our recipe on how to eat flaxseeds. Flaxseeds are not new to Indian cuisine – they have been available since decades, known by the name of mukhwaas. Flaxseeds are tiny treasure troves of goodness, being high in fibre and omega-3 fatty acids . These gluten-free seeds do wonders for your heart. The insoluble fibre in flaxseeds also prevents surges in blood sugar levels, making it a good choice for those with diabetes , weight-watchers and everybody else. Lemon water: Half a lime squeezed in a glass of hot water with ½ tsp of salt is a very effective remedy for constipation. Have it early in the morning even before your mandatory cuppa tea or coffee to regularize the bowel movements. 5. Fennel seeds (saunf): Fennel seeds are well known for their digestive properties. Fennel Tea To Relieve Constipation is a decoction made by boiling fennel seeds in water is a great laxative. Fennel, which is commonly had after meals to improve digestion, is aromatic and has a carminative effect in the intestine. The seeds have a high content of essential oil, which steeps in the water while making the decoction and helps to aid digestion. It relieves constipation and helps reduce flatulence by not allowing undigested food to remain in the colon for a long time. Crush the fennel seeds with a mortar and pestle for best results. 6. Eat a High Fiber Breakfast as fibre stimulates bowel movements. Have a buckwheat dosa which is made from zero rice. Other options are nachni dosa, jowar palak appe, and quinoa dosa. Instead of regular upma try quinoa veg upma recipe. we love oatmeal almond milk with apples as a high fibre breakfast as it is a meal by itself. 7. Drink plenty of fluids (at least 6 to 8 glasses every day) as this softens the stools making them easier to pass. 8. Papaya: Papaya is another effective laxative. Have a cup of chopped papaya with breakfast every day to stimulate bowel movements and see How Papaya Relieves Constipation. It contains a digestive enzyme called papain, which helps to relieve constipation. The fruit’s high water and fibre content also help by adding bulk to the faeces and enabling it to pass the digestive tract faster. The greener the papaya, the higher the papain content in it, so go for partially ripe papayas if you want to relieve constipation. 9. Add High Fiber foods like wheat bran or rice bran in your daily meals. An easy way to incorporate fibre in your diet is to add 1 to 2 tbsp of wheat bran to wheat flour while kneading the chapati dough as in this healthy pyaz ki roti recipe. 10. Ensure you are having healthy fats in your diet. Don't skip the usage of oil in your diet as the result would lead to constipation. It is recommend to have 2 to 3 teaspoons of ghee or oil in your diet. We recommend usage of olive oil as that has healthy omega 3 fatty acids in it and it is part of healthy foods to prevent inflammation in the body. 11. Encourage daily exercise such as walking, running, swimming, biking as this helps in bowel movements. 5 key reasons for constipation. Key reasons for constipation also include staying well hydrated through the day. Drink plenty of water. See below reasons for constipation and lot of it comes down to common sense of not eating processed foods. Cut the rubbish out of your diet. Switch to home made food. Avoid the use of maida in your food and big goodbye to fried food. Eating the wrong food creates inflammation in your body which if you keep doing, leads to all lifestyle diseases like diabetes, cancer, cholesterol and thyroid. 7. Fast foods like pizzas, burgers etc. Enjoy our Indian Home Remedies to relieve constipation, Recipes + Foods for constipation and other home remedy articles below.